Compact Bluetooth connectivity. A truly small and compact Bluetooth Wireless USB adapter for Phone, PDA, Notebook and the rest of your digital life. The new Dynamode BT-USB-M2 breaks the unadventurous design of competing Bluetooth adapters by offering most of the host electronics within the confines of the actual USB connector! 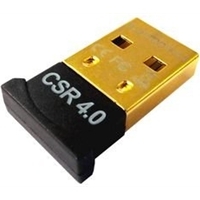 Result a Bluetooth adapter which can be left permanently plugged into a Notebooks USB Port, while in its Notebook bag, or moving from office to office without fear of the device becoming unplugged or damaged. Fully Bluetooth Version 2.00 compliant for simultaneous connections to other Bluetooth devices and a high-powered Class 1 100 metre range using a data transmission of up to 3Mbps coupled with extensive Wireless security. 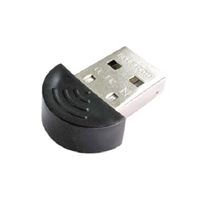 Ideal for Bluetooth PAN (personal area networking), VoIP applications, data transfer and Fax/Dialup applications, the new Dynamode BT-USB-M2 breaks the convention in discrete Bluetooth connectivity.